In the fifth of a 13-part series, looking at each position prior to signing day on Feb. 1, here is a quick rundown of the offensive tackles: those departed, those still on hand, those recruited, what the future holds among current junior recruits, and what the future holds at the position. POSSIBLE POSITION SWITCH: Sophomore-to-be Brad Carrico played offensive tackle in the spring, but projects at guard. Incoming freshman Jarron Jones is a defensive line prospect first, an offensive tackle prospect second. Sophomore-to-be Nick Martin, who was listed as his brother Zack's backup at left tackle for the bowl game, appears to have a future at guard, where he should compete for a starting job. Matt Hegarty, once considered an offensive tackle prospect, appears to be the center of the future. Is Notre Dame coach Brian Kelly the new Lou Holtz? OTS ON THE ND BOARD: Taylor Decker (Vandalia, Ohio; Ohio State commit), Joshua Garnett (Puyallup, Wash.). Neither appear to be very realistic catches for the Irish. Decker, a long-time Irish commit, pledged to his home-state Buckeyes after Urban Meyer was named head coach. Garnett is expected to choose Stanford with Michigan likely second, followed by Notre Dame. Arik Armstead (Elk Grove, Calif.) would be a great catch for the Irish defense at end. But he also has tremendous upside at offensive tackle. 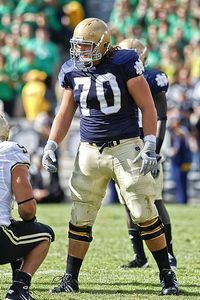 The Irish lose the underrated Taylor Dever at right offensive tackle, where he started 23 games over his final two years in a Notre Dame uniform. He was a consistent performer and a big part of the chemistry that helped develop a much improved rushing attack and an effective pass-blocking unit. The left side of the line remains in good hands with senior-to-be Zack Martin, who has started all 26 of Notre Dame's games the last two seasons. There were a couple of shaky performances along the way in 2011 against some of the better competition on the schedule, but he's about as good as it gets in terms of the pass-blocking/run-blocking-in-space combination. The offensive tackle depth chart is a bit skimpier than anticipated because of the decision by recruit Taylor Decker to change his verbal commitment from the Irish to Ohio State. It was a tough hand to be dealt in mid-January after Decker verbally committed last spring, especially with the pursuit of West Coast standout Josh Garnett taking a turn away from the Irish. But young talent abounds in juniors-to-be Christian Lombard and Tate Nichols, and sophomore-to-be Jordan Prestwood, who transferred to Notre Dame after originally committing to the Irish and then enrolling at Florida State in 2010. Incoming freshman Ronnie Stanley gives the Irish 14 years of eligibility among its four young offensive tackles. Lombard figures to be the odds-on favorite to follow in Dever's footsteps at right tackle, although with no pecking order defined at the present time, a healthy Nichols - which he was not throughout the 2011 season - or Prestwood could contend for the spot. Best man wins the right tackle job among Lombard, Nichols and Prestwood. Chances are the consistency of Notre Dame's offensive tackle play will take a step back in 2012, particularly early in the season as the new kid gets his feet under him. But that should change in fairly short order as talent/repetitions bring the capable talent up to speed.